Spotted in Mabolo, Cebu City by Brennan of Baktin Corporation. Thank you! Been to Kuala Lumpur, the capital of Malaysia, twice, but, regrettably, only spent a day for each visit. 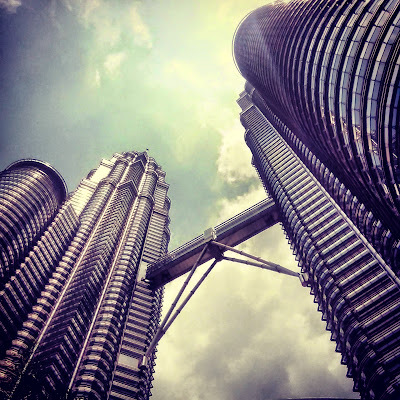 Take a mandatory tourist photo of the Petronas Twin Towers. We were too stingy to spend MYR 85 (about Php 1000) to go up to the observatory. How to go to Petronas Twin Towers: Take the LRT to KLCC Station. Window shop at Central Market. Stingy still for shopping, so it was just window shopping for me. I would rather spend my money on food (see next item). How to go to Central Market: Take the LRT to Pasar Seni Station. 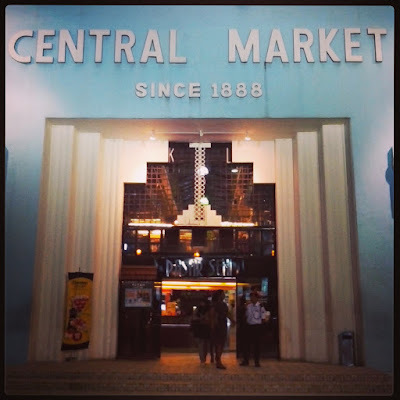 Central Market is a 5–minute (400 m) walk from the station. Eat in Jalan Alor, a food street in Bukit Bintang. How to go to Jalan Alor: Take the monorail to Bukit Bintang Station. Jalan Alor is a 5–minute (400 m) walk from the station. Masjid Jamek, a mosque built in 1907 and is the oldest mosque in Kuala Lumpur. It was a scorching day and we were in clothes appropriate for the beach and not for a mosque. Thus we could not step foot inside and just took a quick snap from the gate. How to go to Masjid Jamek: Take the LRT to Masjid Jamek Station. 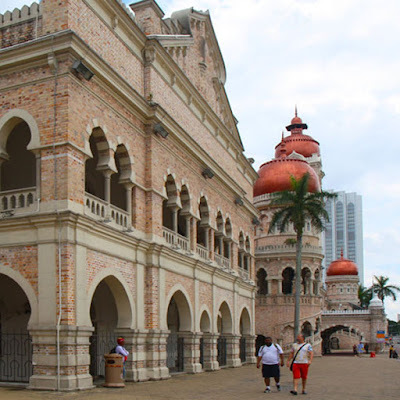 Merdeka Square (aka Dataran Merdeka), where we took pictures of buildings (Sultan Abdul Samad Building and the Royal Selangor Club) and went in the Kuala Lumpur City Gallery. 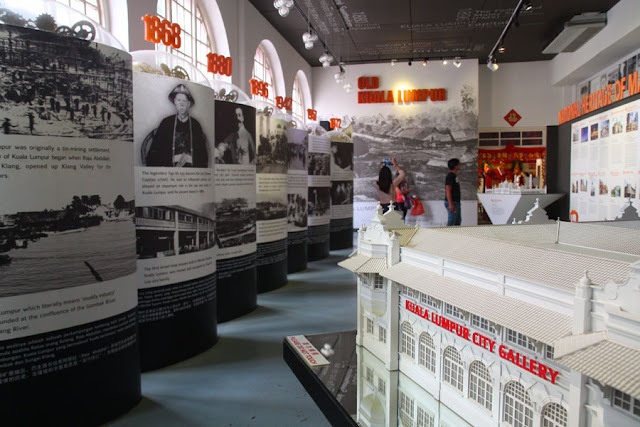 For just MYR 5, we saw an awesome 3D mapping of the metropolis (called the Spectacular City Model Show) in the KL City Gallery and had a snack, too (the admission ticket could be used to purchase anything from the gift shop and cafe inside the gallery). 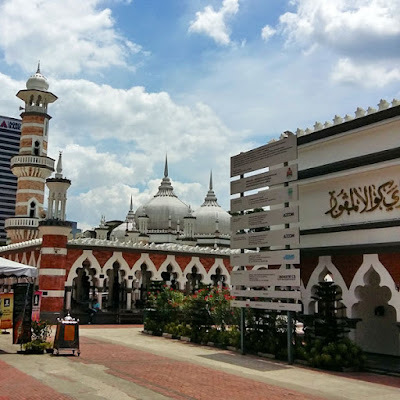 How to go to Merdeka Square: Take the LRT to Masjid Jamek Station. 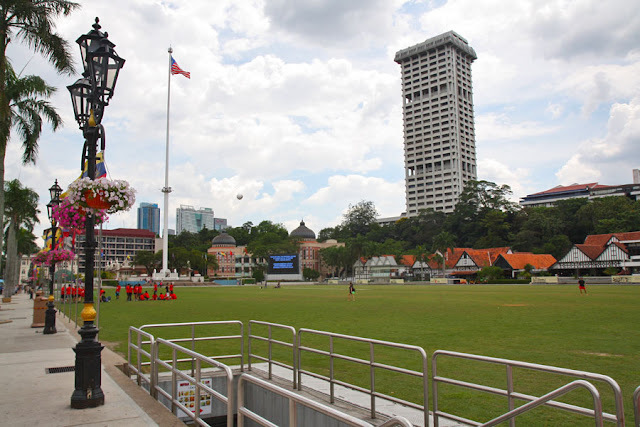 Merdeka Square is a 6–minute (450 m) walk from the station. Should I attempt a third one–day visit in 2016? Maybe not. But, if and when I do find myself in Kuala Lumpur again, I would be sure to spend more than just a day in this metropolis. 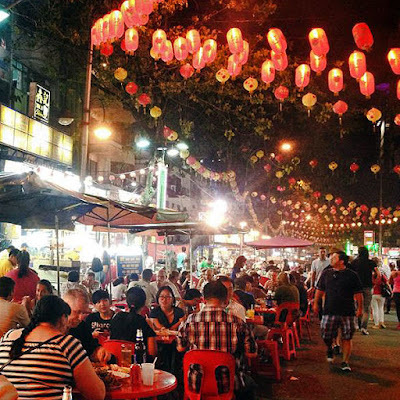 Option 1 Escape KLIA2 by going to Kuala Lumpur city center, an hour away, to go on a food trip at Jalan Alor. Option 2 Go to Gateway@KLIA2, the mall within the airport, to shop (some shops are open 24 hours, some up to midnight) or to eat, eat, and eat (most restaurants are open 24 hours). Option 3 Get some sleep on an airport bench (free) or a proper bed (not free). 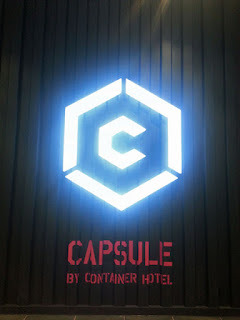 There are three accommodation options in KLIA2: Sama-Sama Express, Plaza Premium Lounge, and Capsule by Container Hotel. Sama-Sama Express is located in the International Departure area (no need to clear immigration) and is only for guests on transit to another international flight. Plaza Premium Lounge and Capsule by Container Hotel are located at Gateway@KLIA2. They ate dinner at Nando's, and bought a tub of yogurt and some fruits from Jaya Grocer. Then checked in at Capsule by Container Hotel, which Mustachio was pretty excited about—it was his first time to stay in a capsule hotel. Mustachio and friends booked Capsule ahead via the hotel's website: MYR 5 cheaper than the walk-in rate. There are three options: 3 hours (MYR 50), 6 hours (MYR 75), and 12 hours (95 MYR). Upon check in, they were given a bag (which they could keep) with a towel (to be returned), a key card to access the sleeping area, and a locker key. They excitedly stored their bag in the locker, went into the sleeping area to see their assigned capsule, inspected the toilet and shower area, then hung out at the lounge or common area. The capsule was clean and comfortable (might be scary for the claustrophobic). It had two pillows, a blanket, a comfy single mattress, a reading light, a phone (don't forget to request a wake up call! ), a small table that folds into the capsule's wall, a secret compartment, an outlet, a shoe compartment, and a roller shade for privacy. The toilets and shower rooms were clean. Shampoo and soap were provided. 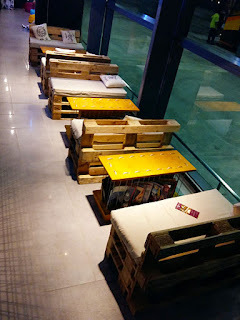 The common area or lounge interiors looked really cool with benches made of crates. Their 6–hour stay at Capsule was pleasant and quickly became a favorite that they stayed there again on their layover at the end of their journey. Layovers can be a bore. Bring a smartphone or tablet loaded with an ebook or two or a whole library of ebooks. Just make sure your gadget is fully charged or that you have your charger or powerbank with the right cable for your gadget. Or, if you're old school like me, a book. But be sure you don't get too caught up in the story that you miss your flight. If you have a smartphone and there's WiFi, you can also check emails and do some work, but I do not recommend this if you're on vacation!!! If you're a professional sleeper, then you can probably catch some Zzzzs in any position anywhere. If you have to sleep in a horizontal position on chairs, don't occupy too many seats please! During peak times, please take just one chair and sleep in a sitting position!!! Don't be a hog taking three extra seats plus one more seat for your bag. If I see you do that, I will sit on you! If you can only sleep on a bed or a soft and comfortable chaise lounge, you might have to shell out some money to stay in an airport hotel or lounge (if the airport you are in has one). Ninoy Aquino International Airport (NAIA) Terminal 3 has The Wings Transit Lounge on the 4th floor. 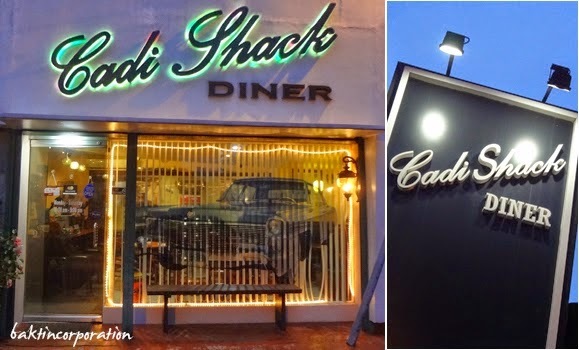 It would cost Php500 for a 4–hour lounge stay with a very light meal. But be sure you don't sleep too deep that you miss your flight. Some airports have spas or, in the case of small domestic airports in the Philippines, stalls offering massage. But be sure to check the price first...sometimes prices can be high. If you don't like reading books, are not sleepy, or don't have money for a massage, how about talking to the person next to you? But before striking a conversation, check that he or she is not reading a book or sleeping!